Paper registration forms are available at the Chamber office, 10-4pm, Tuesday-Saturday and on the Chamber web site. 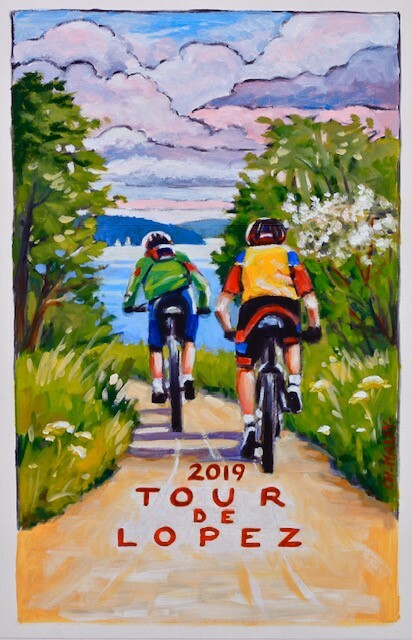 This very popular non-competitive bicycle tour of Lopez Island is the kickoff event for cycling in the beautiful San Juan Islands. Whether you make it a day trip or make it a weekend getaway you will not be disappointed! Many of our riders return every year for this event. There are four routes (5, 12, 17 & 31 mile) that are marked with our unique recycled bicycles. There are three designated rest areas that offer great bakery treats from Holly B's, fresh organic fruit provided by Blossom Grocery, water and other assistance if needed. Rest areas open at 8:30am. All routes end in the Village at Lopez Community Center where you will enjoy a 3 course BBQ, provided by The Galley Restaurant and served from 11:30am - 2:30pm. Visitors and locals alike enjoy lunch, a beer garden and music in the Pavilion.